I replaced four-patches with string blocks in the traditional Sunny Lanes pattern. I'm not thrilled with the 'lanes" at the edges of the quilt--next time, I'll spend a bit more time planning a symmetrical pattern. I do, however, love the colors and the fun fabrics. 74" x 94"
I really like it! I love all the color. That's such a good idea. I'm on a string quilt/use up some of my stash binge lately. I'm going to have to add this one to the list. 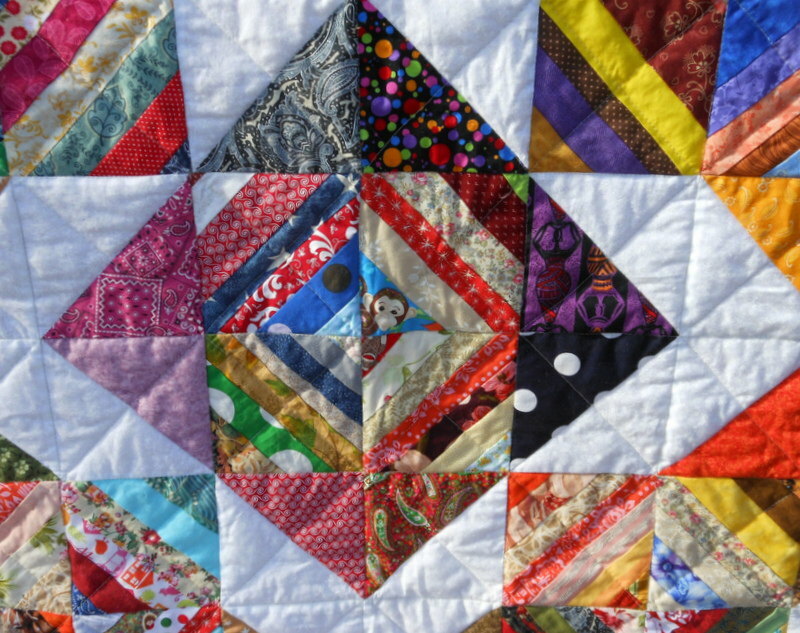 ​Great quilt! 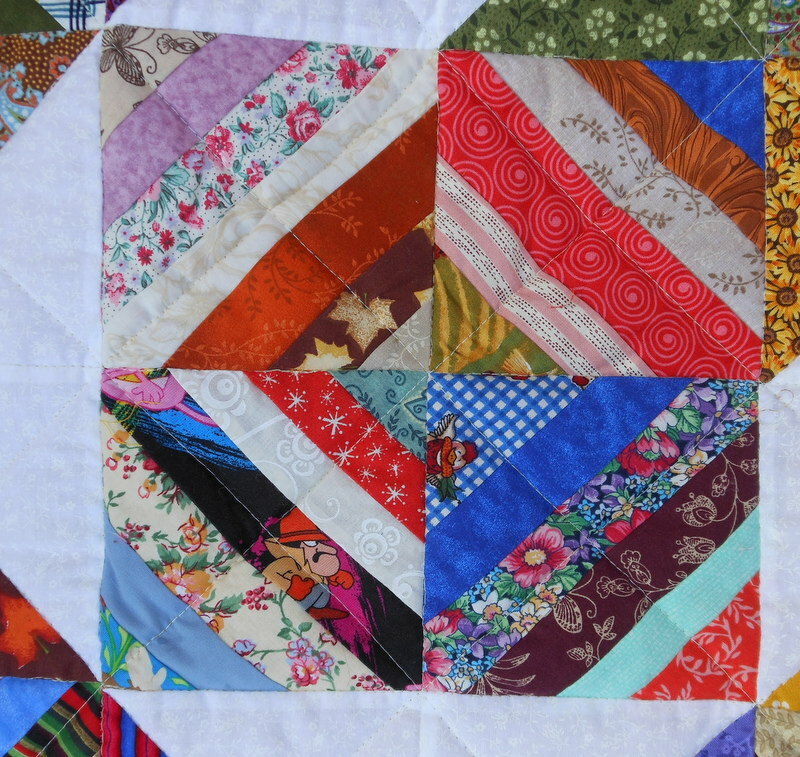 I love looking at scrap quilts and finding fabrics I have in my stash or have used. I loved that blue flower with paisleys so much I had it in purple and green. 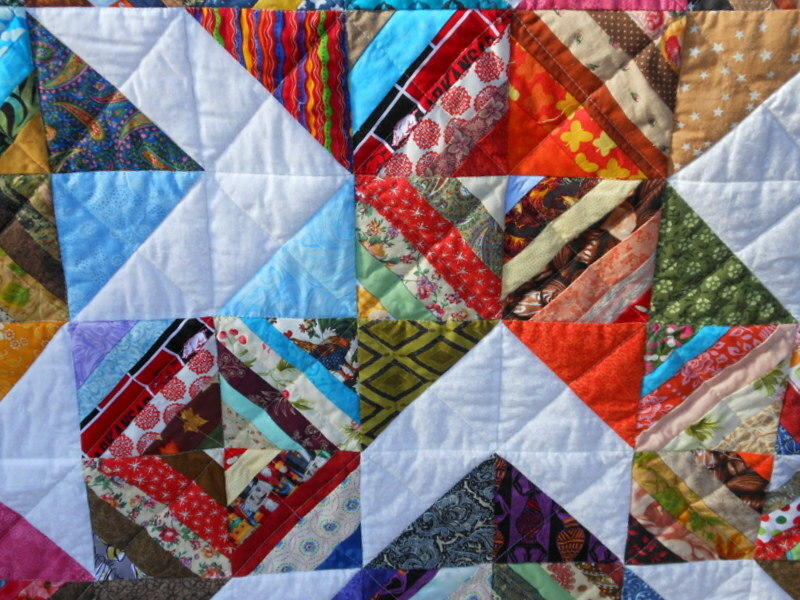 What a great scrappy string quilt design. Great work love seeing your designs very inspiring. what a great idea! I like it very much! I really like it - a great way to use scraps. Wow! I really like this alot! Given enough time and 'leftover' fabrics this should be easy and even fun to accomplish! 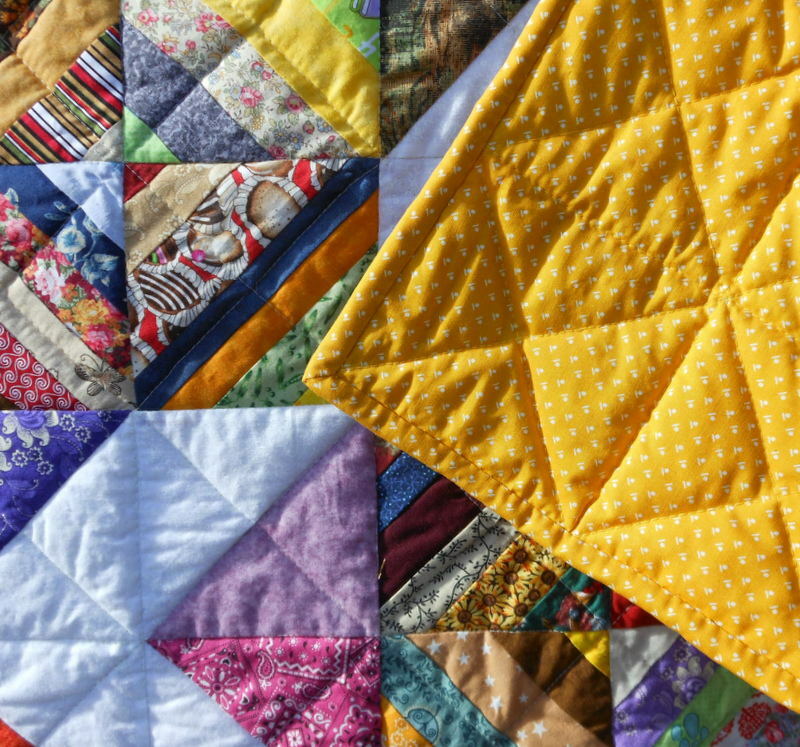 That's a gorgeous scrappy string quilt! So many strings! 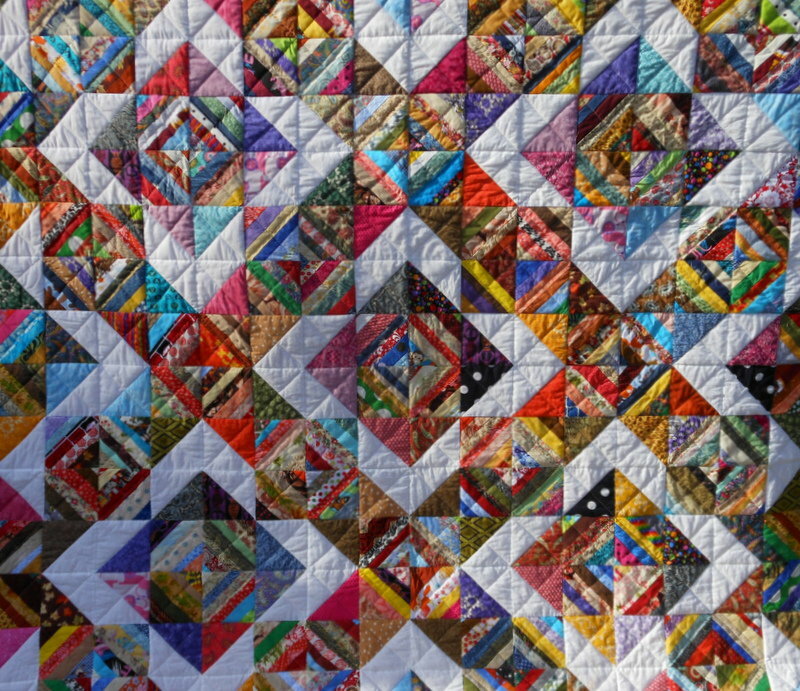 What a wonderful, colorful quilt! I love that little monkey peeking out! Great job!! Oh boy!! Another way to use strings. Thanks so much for this idea. Your quilt is bright and beautiful I love it! Angelia, this is stupendous! It is right at the top of a list that is called My Favorites by Angelia!" Love this quilt! 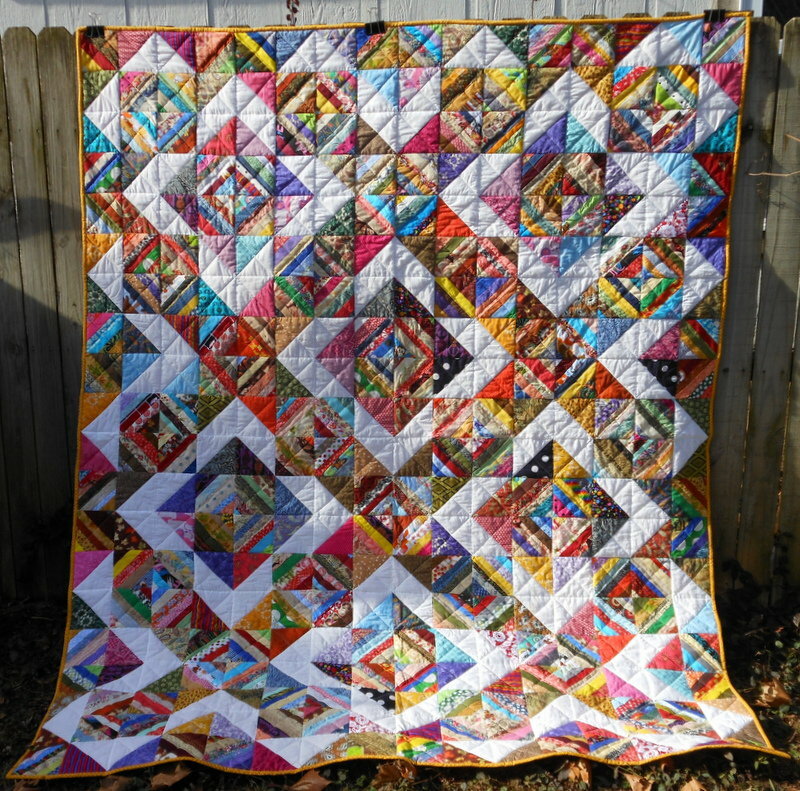 String quilts normally are too busy for me, but this one will be on my bucket list! Great job! I could have written this response. Ditto from me. Working on a string quilt with a pattern that makes hearts. Trying to use up all the scraps I'm drowning in! My son accused me of becoming a hoarder! Oh No! but the string quilt doesn't even seem to make a dent in the scraps!!!! Love all the color and the layout of color versus white and blue. I love this quilt. Your design is fabulous! It's bright and happy! Great yellow backing too!